Image caption Police say they believe the killing was a "targeted incident"
A second arrest has been made after a man died in a North East Lincolnshire seaside resort. Shaun Lyall's body was discovered when officers were called to a house in Sidney Street, Cleethorpes at 18:45 BST on Tuesday. A 44-year-old man has been held in connection with Mr Lyall's death, Humberside Police said. A 33-year-old woman was arrested on Wednesday night as part of the investigation. 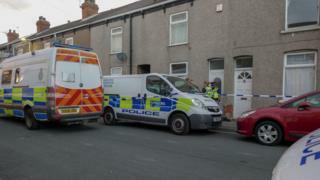 The man was arrested on Rutland Street, Grimsby on Thursday and he remains in custody for questioning. The force previously said it was a "targeted incident" and did not believe there was any threat to the wider community.